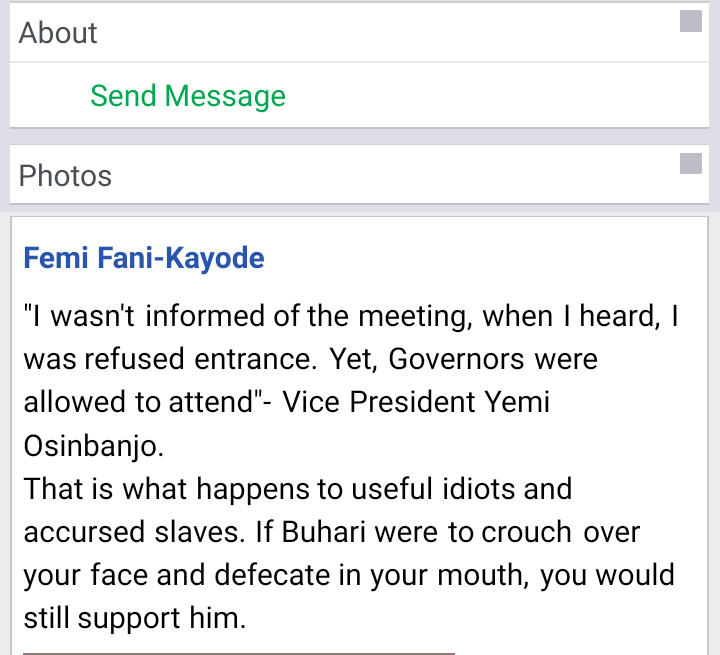 Former Minister of Aviation, Femi Fani-Kayode has mocked Buhari's Vice president Yemi Osinbajo for saying he was denied access into the venue of security council meeting while governors were allowed. Recall that President Buhari on Tuesday met with some security chiefs and state governors over insecurity in some parts of the country. Reacting on his official Facebook page, Kayode said, "If Buhari were to crouch over your face and defecate in your mouth, you would still support him. "That is what happens to useful idiots and accursed slaves. If Buhari were to crouch over your face and defecate in your mouth, you would still support him.